In the main section below we mentioned that the longer the flight distance, the less you'll pay per mile (usually). 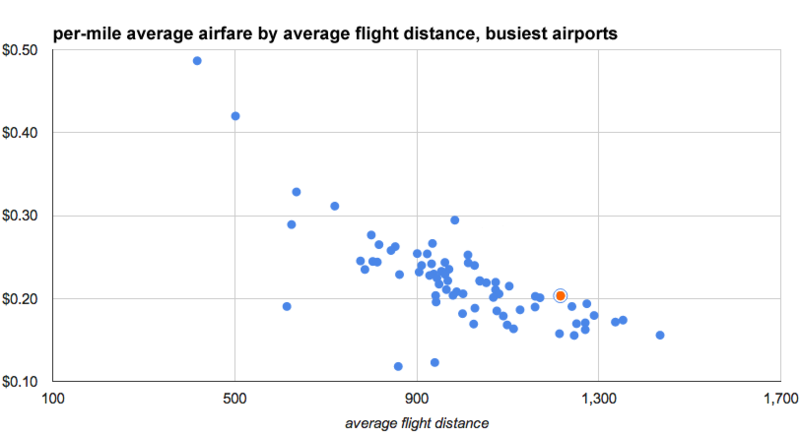 Here's a graph to look at that idea: it charts the average per mile price of airfare out of the busiest airports (left axis) against the average flight distance for each of those airports (bottom axis). 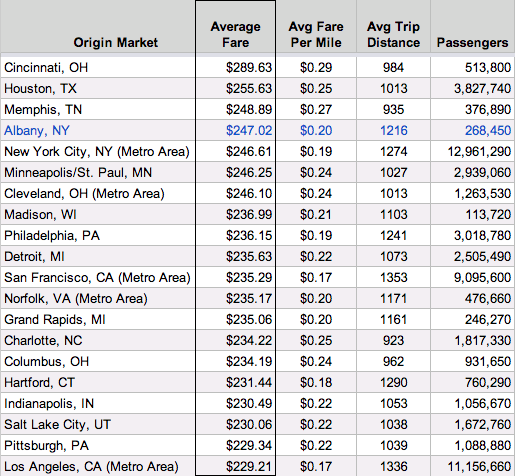 See how the per-mile price declines as the flight distances grow longer. ALB is the orange dot. How high? It depends on how you measure. The Albany airport ranked #17 in the nation for highest average domestic roundtrip airfare among the top 100 busiest airports during the fourth quarter of 2013, according to numbers recently released by the federal government. The average fare out of ALB: $434.60. The national average was $381.05. One of the issues with those average fare figures from the federal Department of Transportation is that they don't account for the average distance of trips from a particular airport. That's an issue because the farther the distance you fly, the more you're (generally) going to pay for a ticket (in total). And, as it happens, the average flight distance out of ALB tends to be among the highest in the country when compared to the busiest airports. 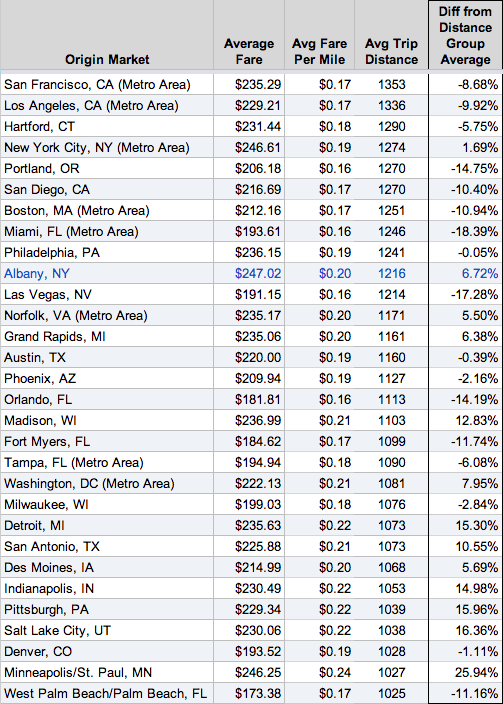 But compared to other longest-average-distance markets, Albany's not so cheap per mile. In this case, by "similar" we mean an average trip distance within 200 miles of Albany's average distance. (That range is more or less arbitrary -- you will get different results with different ranges.) Average per-mile airfare for this group: roughly 19 cents. 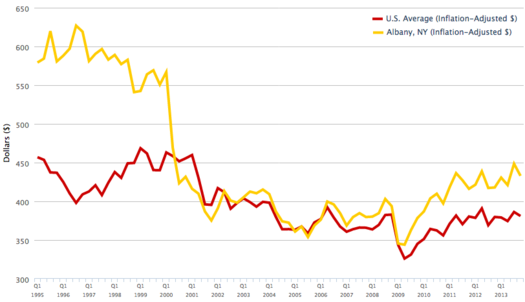 In this context, Albany's rate is OK -- but it doesn't look cheap. + Albany's average airfare is relatively cheap on a per-mile basis compared to other high average fare markets. 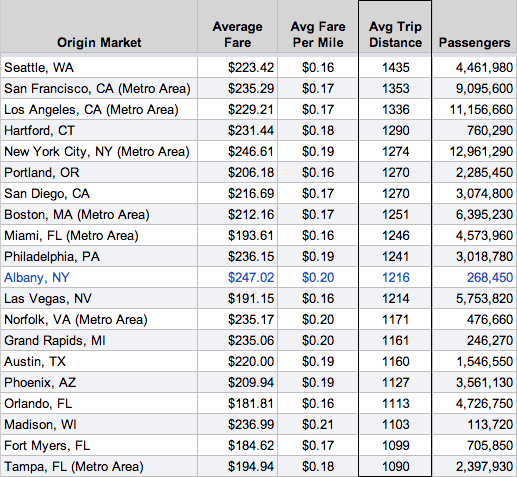 + But compared to other markets with similar average trip distances, Albany is not cheap. * Source: US Department of Transportation, Domestic Airline Consumer Airfare Report 3rd Quarter 2013, Table 2 | We're standing on the edge of a deep rabbit hole of data. But, in short, this set of numbers is different from that roundtrip average airfare set mentioned at the top because 1) it's only looking at the 3rd quarter of 2013 (the most recent available) 2) it's looking at one-way fares and 3) the set only includes flights from the top 1000 city pairs (involving markets with 100,000 or more passengers). The US DOT figures this set covers about 70 percent of all domestic air passengers. So, it's not necessarily comparing apples and oranges, but they are two very different types of apples -- maybe even apples and pears. Click for a larger view. Source: USDOT Bureau of Transportation Statistics. + That huge drop in average fare price in the year 2000. That was the same year Southwest started service out of ALB. That drop was remarkable: The average fare in the first quarter of 2000 was $566.88 -- in the second quarter of that year it was $469.34. + The way the average fare price has been creeping up since it hit its most recent low during the economic downturn. 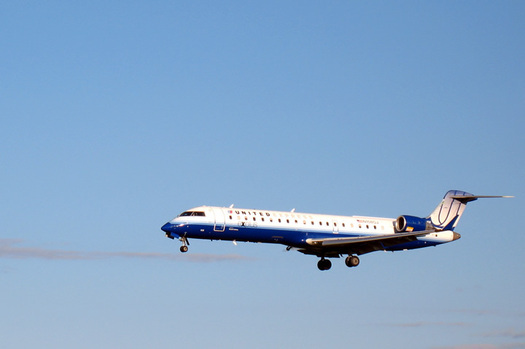 While still not as high as the peak just before Southwest entered the market, during 2013 the average fare rose to a level not seen since early 2000. Fares out of ALB dropped a lot in 2000. They've been rising over the last handful of years. Source: USDOT Bureau of Transportation Statistics, T-100 Segment data. Numbers are for scheduled domestic flights. So, let's talk about Southwest a bit. Its arrival here coincided with a big drop in average fare price. And the airline has historically had a reputation for low fares -- though that's been changing in recent years. 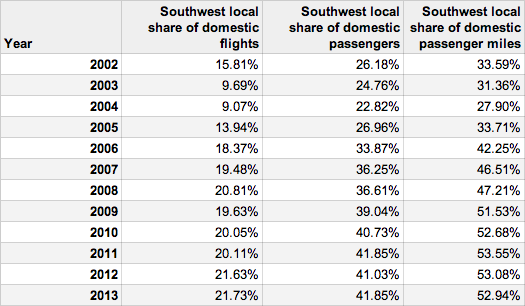 After entering the local market in 2000, Southwest has steadily grown its slice of the local air travel market -- so much so that it now has about half the pie (depending on how you're baking it). Another thing: Average airfares are rising generally, but if Southwest is raising its average fare faster than the national average -- its average fare was up 5.4 percent last year, compared to the overall national average fare increase of 1.8 percent** -- it will have a bigger effect here because Southwest represents such a large chunk of the local market. *Passenger miles are the number of people on an airplane multiplied by the the distance the plane travels. So a plane carrying 10 people on a trip 100 miles in distance would rack up 1000 passenger miles. Source: USDOT Bureau of Transportation Statistics, T-100 Segment data. Another factor in the price of airfare: supply. And the supply out of ALB -- that is, the number of flights and the number of seats available on flights -- has been declining over the last few years. The table above depicts some numbers related to that topic since 2002. + The number of seat miles* available out of ALB on domestic flights is down 23 percent since its recent peak in 2005. + The number of domestic flights is also down, more than 48 percent since its recent peak in 2004. 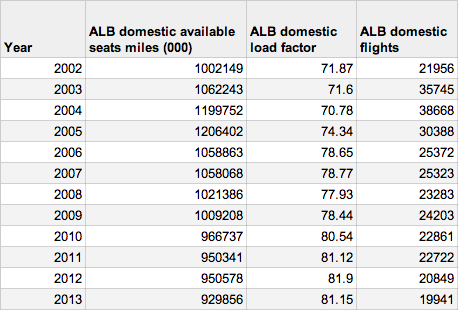 + The "load factor" -- the percent of available seats used on all the flights out ALB -- has reached 81 percent for the last three years. A decade ago it was in the 70-72 percent range. *Seat miles are like passenger miles (above), but for a seat on a plane -- whether it has a person riding in it or not. So here's the super short version: The cost of a plane ticket out of Albany is high compared to the rest of the country's busiest air markets, though it's less so compared on a per-mile basis. And while Southwest appears to have prompted a big drop in airfare prices here during the last decade, prices have once again risen to a pre-Southwest-in-Albany price. I think the reason our miles are so high is because you can't get a direct flight anywhere. You have to fly to a hub, adding unnecessary miles. You have to go through Chicago or Boston, or Philly for the most part. It's not efficient. Once JetBlue arrives, I'll be a happy camper. SWA is trash and prices fares high here because there's no alternative. ALB to DEN is $475 and no direct flight total time 7 hrs if you don't have a delay in between flights or fly from Newark for $220 direct flight 4 hr 25 min. Since I live south of ALB I'm flying out of a NYC because it makes more sense for me especially when you want to fly a family of 4. SWA is lower out of ALB then others but it's still to expensive for a family to fly they know that they don't have any competition I welcome JetBlue. No, it's because prices are rising fast. I remember time of 100-buck roundtrips to DC just about 5 years back. Now the same ticket is around $400, luggage not included. And it's cheaper to fly with a connection rather than direct. Southwest's rates have definitely climbed. I used to be able to do a round trip to BWI for under $100 when they first arrived. Today I booked the trip for just over $200. One way. Albany, as far as I can tell, no longer has any international flights either. You used to be able to fly to Montreal, Ottawa, and Toronto. But those are long gone. I seem to recall that in the early 90's NYS also helped by subsidizing the ALB->SYR->ROC->BUF route. There were several flights per day. Try finding one now. Seeing that average price creep up makes me more excited for the arrival of Jet Blue. Especially when you see the % of passengers and miles with SWA rise from 30% to over 50%... Competition hopefully will make things cheaper! The only part about Jet Blue's arrival that I was disappointed about is the announced routes so far were what- Fort Lauderdale and Orlando? Snooze. Hopefully they offer some non-stop flights further west (to some more interesting cities) and don't just operate as a Disney shuttle bus. I'll be driving to JFK for a domestic flight in May. Inconvenient, but flying from Albany would have added more than $700 to to the trip. We had a rather surprising experience last month when booking airfare to Missoula. With Missoula and Albany both home to relatively small airports we thought that if we launched from Philly, Newark or one of the other nearby big cities, it would be cheaper. It wasn't. By the time you figure time and transportation to the other airports we spent HUNDREDS less flying out of Albany. It was a ridiculous 3-leg trip but we ended up with tickets under $500 when they were running closer to $800 out of the big cities. Lu's observation is spot-on and it absolutely baffles me, but direct flights are usually more expensive than those with connections. I don't get that at all. If I want to fly to Chicago it's $354 with a stop in Philly or $503 if I want to fly direct. In what world does that make sense? Airline prices have climbed 30-40% over the last decade. It cannot all be explained by gas price and other cost increases. It is obvious that airlines are colluding, just be on kayak alerts for a while and you will see how they change instantaneously across airlines. In response to Valerae and Lu: you should not be surprised that direct flights are more expensive: wouldn't you rather fly direct than connect through some other airport? The demand side effect (people willing to pay more to fly direct) trumps the supply side effect (airlines have lower costs of flying you direct) in this case. From time to time I am tempted by low fares out of JFK but then I do the math. Counting travel time I won't get there any faster and I have to consider train fare or expensive parking if I drive down. All that said, my trips are definitely getting more expensive on Southwest. JetBlue's first itineraries are all to Florida so I'm not expecting much relief on my routes. We were told by our elected leaders many years ago that if we invest our tax dollars into Albany Airport, competition will come and we will benefit via lower fares. Our elected leaders (knowing words mean more than reality or actions) decided to name it Albany International (despite that we don't have international flights). So now I drive to Boston (3 hrs) and fly direct to many cities for 1/2 the price to fly out of Albany. The Boston direct flight means my total travel time is equal to flying out of Albany. I also buy gas & food along the way which adds money to Mass's coffers vs. NYS. I've emailed Doug Myers (Albany airports spokesperson) and asked him to explain why my family saves over $1500 by driving 3 hrs to Boston (to avoid Albany) but he has never responded to multiple inquiries. @flyer, that makes sense, I hadn't really thought of it that way. I was thinking more along the lines of what it costs the airline. Heaven forbid any of the ticket prices were based on the actual cost to the airline. RE: direct flights; the demand premium is certainly a large factor in the price, but the hub system is probably the root cause. It is more efficient (cheaper, overall) for the airline companies to filter as many passengers as possible through their major hubs to take advantage of volume. Logistics and costs go up when you add flights between every airport. Think of it like supply chain, mail/parcel or big-box logistics; everything goes to a distribution center and is shipped to stores or customers from there rather than directly from origin. Doug Myers, enemy of free speech. The other issue with flying out of ALB is that you are getting flight crews from contracted operators, not the big national carriers. These pilots tend to be much less experienced, are paid less and are usually overworked/sleep-deprived. I will *never* fly out of small market airports just for the safety issue.